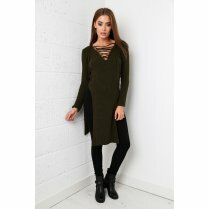 Opt for a casual look this season with this gorgeous jumper dress, perfect for those chilled days. With a deep v-neck front and a flattering fit, you'll definitely be the envy of your friends! Team yours with skater pumps for a laidback look or wear with chunky boots to add an edge to this beauty!